The Bart Ingredients Company Ltd. has grown over the last 50 years and now sources ingredients from across the globe. Back at Bart’s base in Bristol, its culinary experts work with flavours to create herb harmonies and spice symphonies which add an extra touch of magic to home cooked dishes. By working with suppliers in different corners of the world, Bart has come to realise that not all ingredients are equal and a myriad of reasons can change the flavour profiles of its favourite spices. Because we’re cooks too, we know the fun that can be had with adding a sprinkle of this or a dash of that to your favourite dishes. 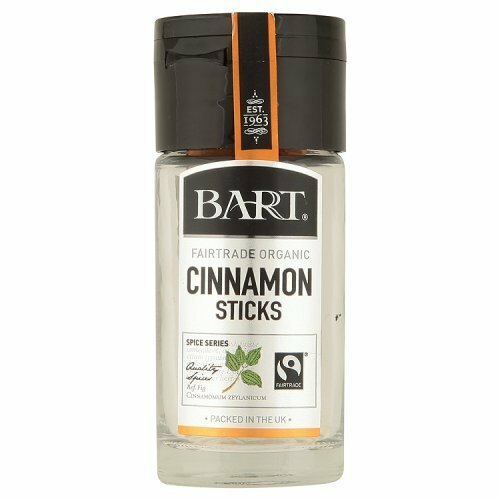 Bart Fairtrade Cinnamon Sticks are grown by a small farmers' association on the island of Sri Lanka. A store cupboard staple that can add a spicy kick to stews and casseroles. Frontier Herb Organic Cinnamon Stick - Seasoning, 2 3/4 inch Long - 3 per case.